German merchant and philanthropist; born in Hanover 1767; died in Hamburg Dec. 26, 1844. Going to Hamburg when he was sixteen and practically penniless, by 1797 he had become one of the chief members of the banking firm of Heckscher & Co., with which he continued until 1819, when he established an independent business which grew to be one of the most important banking firms in Europe. He extended his operations far and wide, especially devoting himself to dealing in foreign loans and stocks. Having his capital in so many different undertakings, he was not embarrassed by the crisis of 1825, nor even by the great fire at Hamburg in 1842, when he checked a panic by offering a million thalers on the loan market. Toward the loan for rebuilding the city, which amounted to 32,000,000 thalers, he contributed no less than 8,000,000; while he donated the insurance paid on his own mansion, which had been burnt down, to the fund raised to repair the damage caused by the fire. 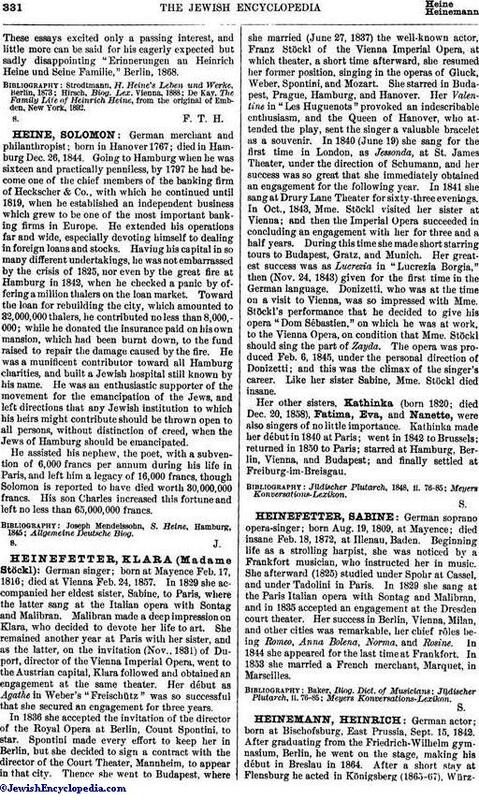 He was a munificent contributor toward all Hamburg charities, and built a Jewish hospital still known by his name. He was an enthusiastic supporter of the movement for the emancipation of the Jews, and left directions that any Jewish institution to which his heirs might contribute should be thrown open to all persons, without distinction of creed, when the Jews of Hamburg should be emancipated. He assisted his nephew, the poet, with a subvention of 6,000 francs per annum during his life in Paris, and left him a legacy of 16,000 francs, though Solomon is reported to have died worth 30,000,000 francs. His son Charles increased this fortune and left no less than 65,000,000 francs.